Molluscum Contagiosum is a viral infection of the skin or occasionally of the mucous membranes. 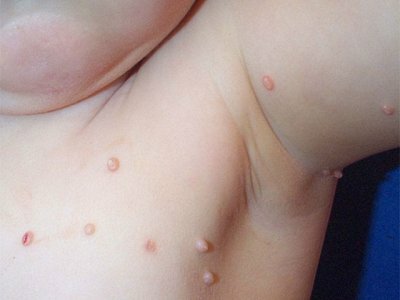 It is caused by a DNA poxvirus called the molluscum contagiosum virus (MCV). MCV has no animal reservoir, infecting only humans. There are four types of MCV, MCV-1 to -4; MCV-1 is the most prevalent and MCV-2 is seen usually in adults and often sexually transmitted. This common viral disease has a higher incidence in children, sexually active adults, and those who are immunodeficient, and the infection is most common in children aged one to ten years old. MC can affect any area of the skin but is most common on the trunk of the body, arms, and legs. It is spread through direct contact or shared items such as clothing or towels.